Free download Wise Force Deleter latest version.Wise Force Deleter allows you to access it via a context menu. Right after installing it, a new option named “Force Delete” will appear in the context menu. To unlock&delete a locked file, you just need to right click it, select ‘Force Delete’, Wise Force Deleter will be launched. Then you can unlock and delete the file from your Windows system immediately, which is real convenient. Like all other WiseCleaner products, The interface of Wise Force Deleter is very intuitive. Even a first timer can get the hang of it in seconds. Better yet, it also supports drag and drop, making file-deletion super easy for you. 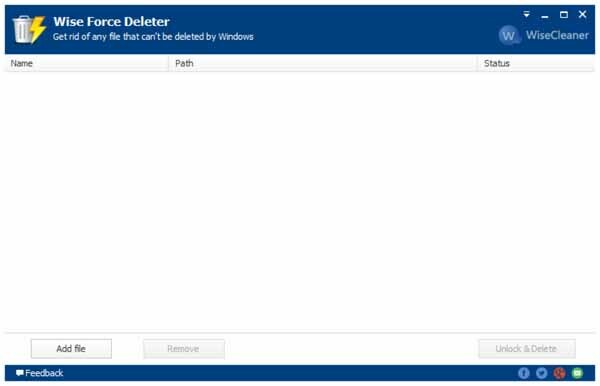 Wise Force Deleter is freeware that allows you to delete any file in your Windows system(64 and 32-bit). It has been developed and fully tested to work great on Windows 8&8.1 and other Windows operating systems, from Windows XP and up. No matter what you own – a desktop or a laptop. Wise Force Deleter is designed to fix all the issues above by terminating the processes using the file or removing file-access restrictions that prevent you from deleting a file. With Wise Force Deleter, you can unlock and delete any file without frustration in Windows.